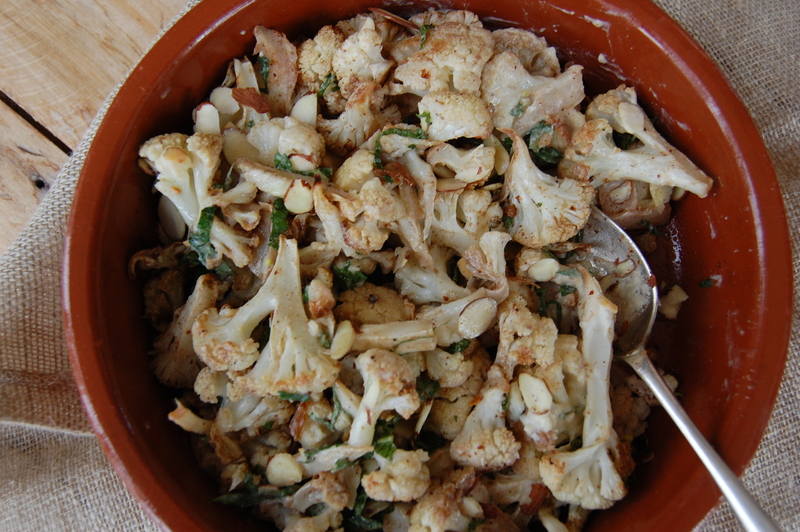 Cut 3/4 cauliflower head into small florets – use the stalk, too. Toss in a roasting tray with a couple of Tbsps oil (I used grapeseed), 2 tsp ground cumin, 2 tsp ground sumac, 1 tsp sea salt, 1 tsp black pepper. Roast in an oven preheated to 200 degrees for about 30 minutes until starting to brown round edges. Meanwhile make dressing by combining 2 Tbsp tahini, 2 Tbsp lemon juice, 2 Tbsp extra virgin olive oil, salt and pepper. Toast 1/4 cup almond flakes and finely slice a handful mint leaves. Toss everything together and serve, lukewarm is nicest.